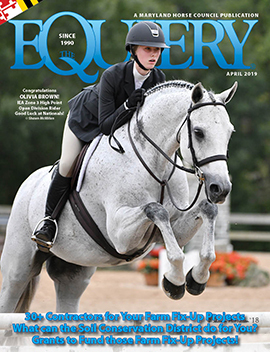 With this issue, we wave farewell to Equiery contributor Tim Capps, who is departing for a new job in Kentucky. In 1995, Maryland lost an esteemed leader of its equestrian community when Rich Wilcke, executive vice president of the Maryland Horse Breeders Association, executive director of the Maryland Million, president of the Maryland Horse Council and editor of The Maryland Horse and Mid-Atlantic Thoroughbred, moved to Kentucky. Stepping into his shoes was Tim Capps – but Tim did more than just replace Rich, becoming a valued leader in his own right. In the often contentious world of flat racing, Tim had a knack for building bridges and cultivating relationships through his ability to articulate a broad vision for Maryland racing. At a time when Maryland politicians looked askance at racing or tried to keep the racing industry at arm’s length, Tim was able to convince numerous politicians to embrace the horse industry as a state jewel by showing them that there was more to it than the ovals. The timing was fortuitous, and helped usher in serious consideration of slots so that we could compete with neighboring states once again. Having built all that good will, it seemed only natural that the owners of Laurel and Pimlico, the DeFrancis family, would want to see that broadened and continued, and they recognized Tim’s gift. With the slots debate heating up, Tim’s transfer back to the Maryland Jockey Club as executive vice president (before his tenure with MHBA, Tim had served as the MJC’s senior vice president) seemed a wonderful opportunity to build on the good will he had already established, crafting more alliances within the notoriously divided Maryland Thoroughbred community and helping the industry as a whole work with Annapolis to pass slots legislation. But it was not to be. Marylanders elected the first Republican governor in decades, and though the new governor had campaigned, in part, on the promise of slots, he was met by a unyielding Democratic House and Senate, which created a partisan loggerhead and doomed any slots legislation during the Republican governorship. During this time, Canada’s Magna Entertainment Corp. acquired majority ownership of the Maryland Jockey Club (which, in turn, owns Laurel Park and Pimlico). So, while battles raged in Annapolis and the press over the morality of slots, while racing leaders scrapped and fought over their dreamed-of slices of the theoretical slots pie (again, prompting the general press to ask: “Why can’t the horse industry get along with itself?”) and Magna tried to figure out how it could make its new investment pay off – with or without slots – Tim slipped out of the spotlight, retiring to the civility and sanctity of a marketing position with the new Maryland Stallion Station. From the sidelines, Tim was able to provide us with knowledgeable commentary, infused with his wry wit, his satirical appreciation for the machinations of politics and his deep affection for the true horsemen of our state. Like Rich before him, Tim has heard the siren call of a state that has formally recognized the value of its horse industry, and that supports said industry through state and academic organizations in a way to which we Marylanders only aspire. In January, Tim will fill the University of Kentucky position vacated by Rich Wilcke when the latter became director of the University of Louisville’s Equine Industry program. Tim will make a fine academic, but we will miss him. We will miss the marathon phone sessions, we will miss the game of handicapping legislation, we will miss the columns that explained how the latest political crises would affect the lives of the average horse person, we will miss the entertaining digressions in meetings, we will miss his vision, and we will miss the French food. Goodbye, Mr. Capps. We know you will have a wonderful career in Kentucky, but here at The Equiery, we will always consider you a Marylander first and foremost.